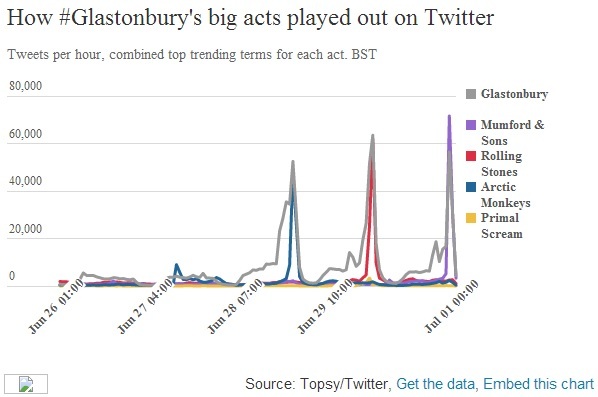 So who was the most popular act at the Glastonbury festival this year? Well it has to be The Stones right whose Saturday night performance was the festival’s biggest, and some have said best, gigs ever. At its peak, nine of the 10 UK trends on Saturday night related to the festival. However on Sunday The Mumfords notched up over 70,000 tweets an hour, nearly 10,000 more than the veteran rockers had the night before. 2 A lot of people were tweeting about how much hated the Mumfords. I would love to know the negative/positive sentiment of the tweets on Sunday (how about it MC Saatchi?) The Mumfords really are the Marmite of UK pop. 3 More people were out on Saturday night, whereas on Sunday they were preparing for the return to work with a spot of Twitter powered TV.